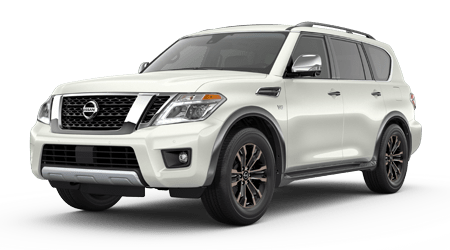 When you drive the new 2019 Nissan Armada, you don’t just get legendary performance SUV with plenty of horsepower; you get a vehicle with the ability to open new doors and to travel to new places. The new Nissan Armada SUV comes with an innovative 5.6L Direct injection Gasoline V8 engine for incredible power, and a 7-speed automatic transmission with Adaptive Shift Controls for a smarter, smoother ride. Plus, the Armada 4-Wheel Drive has been reworked to respond to changing road conditions automatically - without you having to worry. You can find the new 2019 Nissan Armada SUV at your local new and certified pre-owned Wallace Nissan of Kingsport dealership. Meet with one of our helpful staff members and schedule a test drive today. While you are here, ask how the Armada’s rugged frame and suspension can improve your towing capacity. The new design of the Nissan Armada comes with your families individual comfort in mind. The Armada has an available Tri-Zone Entertainment System that has been designed to allow those rear-seat passengers to enjoy a movie, while those up front can enjoy listening to music. It’s features like this that make the new Nissan Armada one of the best SUV’s to take the family on a road trip. When you shop and purchase with us at Wallace Nissan, we strive to make the car buying process as simple and painless as possible. Take advantage of our online features such as our online vehicle appraisal service for your trade-ins. Or, fill out a credit financing report and get pre-approved for an auto loan, all from the comforts of your living room. When you shop with us, you get to work with Nissan experts that help you find the SUV, truck or sedan that meets your family’s lifestyle. Visit us today and see how we can help you!